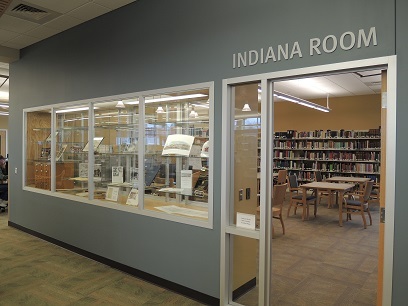 Rediscover Crown Point, Lake County, and the Hoosier State by browsing the Indiana Room, located on the second floor of the Crown Point Community Library. Available during open library hours, the Indiana Room has numerous resources for your research needs. History comes alive as you uncover how Crown Point received its name. Or maybe you’ll learn what is the oldest standing structure in the city. Or maybe you’ve always wanted to know where Ruffle Shirt Hill is located and how it received its unusual name. In addition to books on the history of Crown Point, the Indiana Room has genealogies, old directories, and maps; even old Crown Point High School yearbooks, where you can find pictures of some community parents, teachers, and even a famous astronaut. The Lake County Star newspaper has been reporting on the activities in and around the Crown Point community for over one hundred and fifty years; the Indiana Room has almost every issue on microfilm. The newspaper provides the important stories and events of Crown Point and its citizens throughout the decades. The newspaper is an excellent resource for searching obituaries, marriages, and even the travel plans of your ancestors. Genealogists can take advantage of our Ancestry (available only in the library) and Heritage Quest databases. Indexes for Crown Point marriages, cemetery, and land transfers could provide clues to that family mystery. The pamphlet file is full of many hidden gems, including information about people, places, and events in Crown Point and throughout Indiana. Interested in genealogy? Have a stumper in your research? The Indiana Room has a program just for you. Descendant Drop-In: The Genealogy Help Program is here to help with your genealogy questions and stumpers. Come to the Indiana Room on the second Monday of the month from 10:00 am – 12:00 pm. This is intended for quick questions and help; if you require additional services you may be asked to make an appointment. Stop in and explore all the Indiana Room has to offer. If you are unable to visit the Indiana Room, please contact the Indiana Room for more information. Thank you.